Particularly now, in the era of Donald Trump, US politics denotes an age of forgetting civil rights, full inclusion and the promise of democracy. There is a divorce between thought and its historical determinants, a severance of events both from each other and the conditions that produce them. 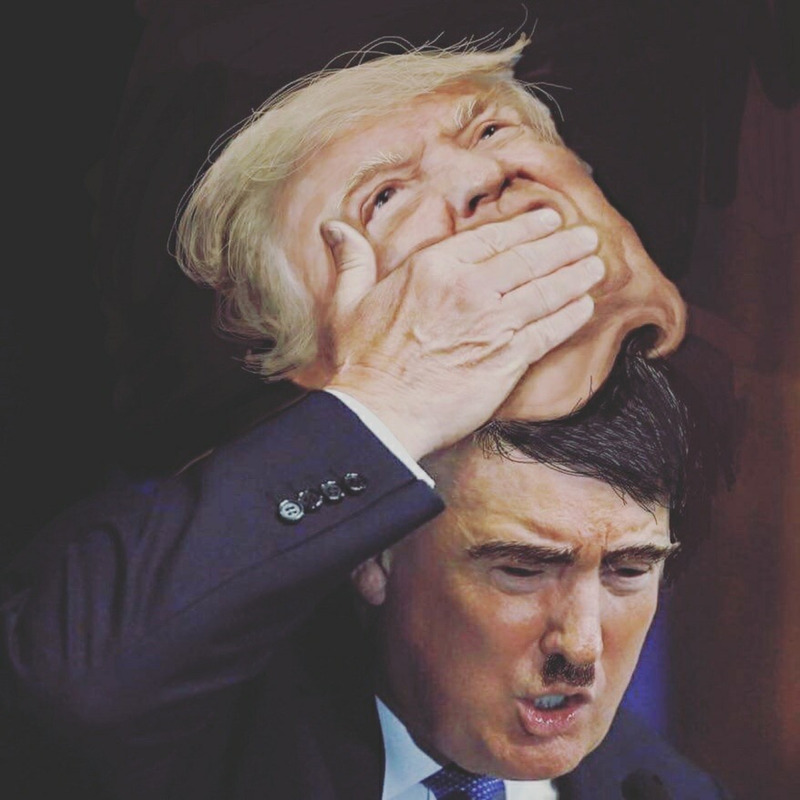 The growing acceptance of state violence, even its normalization, can be found in repeated statements by Trump, the leading Republican Party presidential candidate, who has voiced his support for torture, mass deportations, internment camps and beating up protesters, and embraced what Umberto Eco once called a cult of “action for action’s sake” – a term Eco associated with fascism. Ominously, Trump’s campaign of violence has attracted a commanding number of followers, including the anti-Semitic and former Klu Klux Klan leader David Duke, and other white supremacists. But a death-dealing state can operate in less spectacular but in no less lethal ways. Cost-cutting negligence, malfeasance, omissions, and the withholding of social protections and civil rights can also inflict untold suffering. The recent crisis over the poisoning of the water supply in Flint, Michigan, and the ways in which it has been taken up by many analysts in the mainstream media provide a classic example of how public issues have been emptied of any substance and divorced from historical understanding. This is a politics that fails to offer a comprehensive mode of analysis, one that refuses to link what is wrongly viewed as an isolated issue to a broader set of social, political and economic factors. Under such circumstances shared dangers are isolated and collapse into either insulated acts of governmental incompetence, a case of misguided bureaucratic ineptitude or unfortunate acts of individual misconduct, and other narratives of depoliticized disconnection. In this instance, there is more at work than flawed arguments or conceptual straitjackets. There is also a refusal to address a neoliberal politics in which state violence is used to hurt, abuse and humiliate those populations who are vulnerable, powerless and considered disposable. In Flint, the unimaginable has become imaginable as 8,657 children under 6 years of age have been subjected to potential lead poisoning. Flint provides a tragic example of what happens to a society when democracy begins to disappear and is surpassed by a state remade in the image of the corporation. A more appropriate way to analyze the water crisis in Flint is to examine it within wider contexts of power and politics, addressing it as a form of domestic terrorism – or what Mark LeVine has called in a different context a “necropolitics of the oppressed.” This is a form of systemic terror and violence instituted intentionally by different levels of government against populations at home in order to realize economic gains and achieve political benefits through practices that range from assassination, extortion, incarceration, violence and intimidation to coercion of a civilian population. Angela Davis details much of this violence in her new book Freedom Is a Constant Struggle. Some of the more notorious expressions of US domestic terrorism include the assassination of Black Panther Party leader Fred Hampton by the Chicago Police Department on December 4, 1969; the MOVE bombing by the Philadelphia Police Department in 1985; the existence of Cointelpro, the illegal counterintelligence program designed to harass antiwar and Black resistance fighters in the 1960s and 1970s; the use of extortion by the local police and courts practiced on the largely poor Black inhabitants of Ferguson, Missouri; and the more recent killings of Freddie Gray and Tamir Rice by the police – to name just a few incidents. At first glance, the dual tragedies that engulfed New Orleans as a result of Hurricane Katrina and the water contamination crisis in Flint, Michigan, appear to have little in common. In the aftermath of Hurricane Katrina and the Bush administration’s failure to govern, the world was awash in shocking images of thousands of poor people, mostly Black, stranded on rooftops, isolated on dry roads with no food or packed into the New Orleans Superdome desperate for food, medical help and a place to sleep. Even more troubling were images of the bloated bodies of the dead, some floating in the flood waters, others decomposing on the streets for days and others left to die in their homes and apartments. 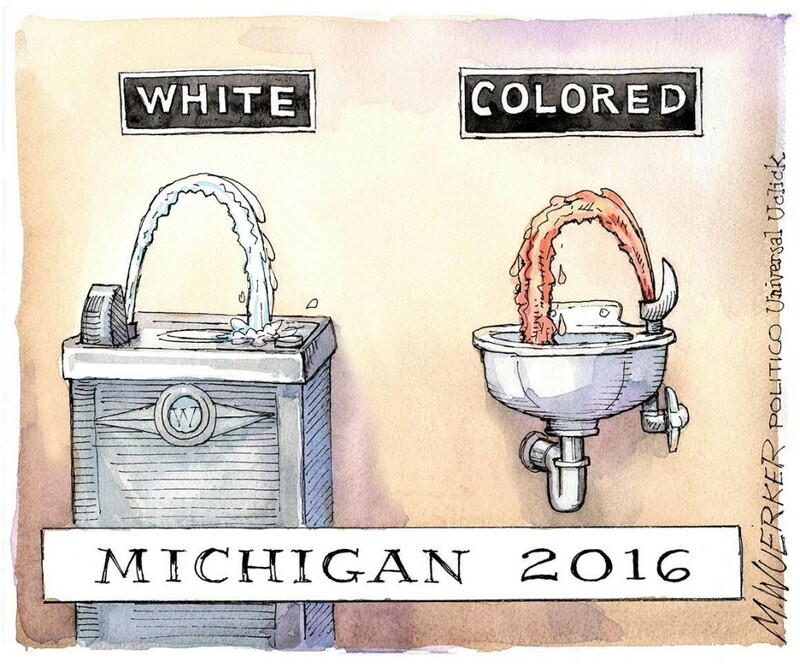 Flint, Michigan, also represents this different order of terrorism and tragedy. Whereas Katrina unleashed images of dead bodies uncollected on porches, in hospitals, in nursing homes and in collapsed houses in New Orleans, Flint unleashed inconceivable reports that thousands of children had been subjected to lead poisoning because of austerity measures sanctioned by Republican Gov. 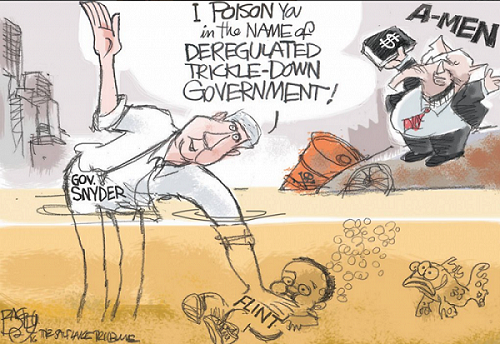 Rick Snyder and imposed by Ed Kurtz, the then-unelected emergency manager of Flint. The poor Black populations of both New Orleans and Flint share the experience of disenfranchisement, and of potential exclusion from the institutional decisions that drastically affect peoples’ lives. They live the consequences of neoliberal policies that relegate them to zones of abandonment elevated beyond the sphere of democratic governance and accountability. Both populations suffer from a machinery of domestic terrorism in which state violence was waged upon precarious populations considered unknowable, ungovernable, unworthy and devoid of human rights. Such populations have become all too frequent in the United States and suffer from what Richard Sennett has called a “specter of uselessness,” one that renders disposable those individuals and groups who are most vulnerable to exploitation, expulsion and state violence. For more than [a] decade now, Michigan governors have been appointing so-called “emergency managers” (EMs) to run school districts and cities for which a “state of financial emergency” has been declared. These unelected administrators rule by fiat – they can override local elected officials, break union contracts, and sell off public assets and privatize public functions at will. It’s not incidental that the vast majority of the people who have lived under emergency management are black. Flint, whose population was 55.6% black as of the2010 census (in a state whose population is 14.2% black overall), was under emergency management from December 2011 to April 2015. [Moreover] it was during that period that the decision was made to stop purchasing water from Detroit and start drawing water directly from the Flint River. The backdrop to the Flint water crisis is the restructuring of the global economy, the deindustrialization of manufacturing cities like Flint and the departure of the auto industry, all of which greatly reduced the city’s revenues. Yet, these oft-repeated events only constitute part of the story. As Jacob Lederman points out, Flint’s ongoing economic and environmental crisis is the consequence of years of destructive free-market reforms. According to the Michigan Municipal League, between 2003-2013, Flint lost close to $60 million in revenue sharing from the state, tied to the sales tax, which increased over the same decade. During this period, the city cut its police force in half while violent crime doubled, from 12.2 per 1000 people in 2003, to 23.4 in 2011. Such a loss of revenue is larger than the entire 2015 Flint general fund budget. In fact, cuts to Michigan cities like Flint and Detroit have occurred as state authorities raided so-called statutory revenue sharing funds to balance their own budgets and pay for cuts in business taxes. Unlike “constitutional” revenue sharing in Michigan, state authorities could divert these resources at their discretion. It is estimated that between 2003-2013 the state withheld over $6 billion from Michigan cities. And cuts to revenue sharing increased in line with the state’s political turn. These policy changes and reforms provided a rationale for the apostles of neoliberalism to use calamitous budget deficits of their own design to impose severe austerity policies, gut public funding and cut benefits for autoworkers. As General Motors relocated jobs to the South in order to increase its profits, its workforce in Flint went from 80,000 in the 1970s to its current number of 8,000. 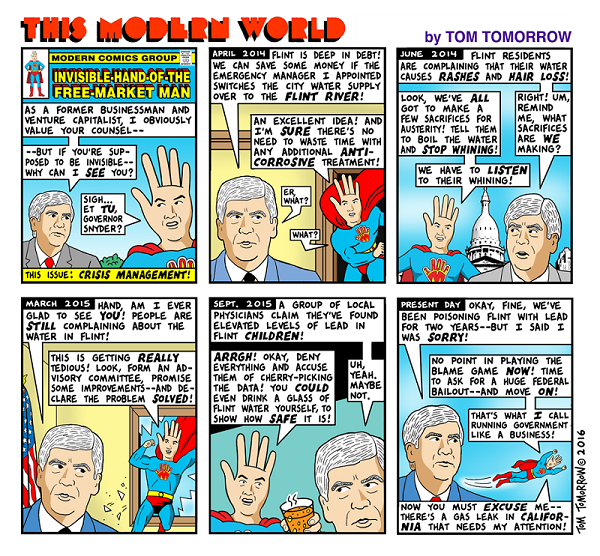 These festering economic conditions were worsened under the Snyder administration, which was hell-bent on imposing its neoliberal game plan on Michigan, with the worse effects being visited on cities inhabited largely by poor Black people and immigrants. Under strict austerity measures imposed by the Snyder administration, public services were reduced and poverty ballooned to over 40 percent of the population. Meanwhile, schools deteriorated (with many closing), grocery stores vanished and entire neighborhoods fell into disrepair. When Governor Snyder took office in 2011, one of the first things he did was to get a multi-billion-dollar tax break passed by the Republican legislature for the wealthy and for corporations. But with less tax revenues, that meant he had to start cutting costs. So, many things – schools, pensions, welfare, safe drinking water – were slashed. Then he invoked an executive privilege to take over cities (all of them majority black) by firing the mayors and city councils whom the local people had elected, and installing his cronies to act as “dictators” over these cities. Their mission? Cut services to save money so he could give the rich even more breaks. That’s where the idea of switching Flint to river water came from. To save $15 million! It was easy. Suspend democracy. Cut taxes for the rich. Make the poor drink toxic river water. And everybody’s happy. Except those who were poisoned in the process. All 102,000 of them. In the richest country in the world. In Kathy Aaron’s decrepit public school, the heat fills the air with a moldy, rancid odor. Cockroaches, some three inches long, scuttle about until they are squashed by a student who volunteers for the task. Water drips from a leaky roof onto the gymnasium floor. ‘We have rodents out in the middle of the day,’ said Ms. Aaron, a teacher of 18 years. 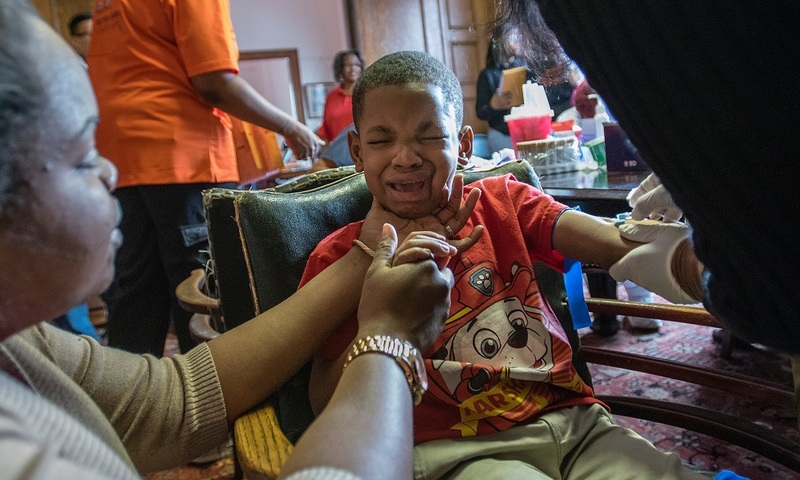 ‘Like they’re coming to class.’ Detroit’s public schools are a daily shock to the senses, run down after years of neglect and mismanagement, while failing academically and teetering on the edge of financial collapse. Under Snyder, “emergency management” laws gave authoritarian powers to unelected officials in cities that have Black majorities who were also made objects of devastating forms of environmental racism and economic terrorism. As Flint’s economy was hollowed out and held ransom by the financial elite, the Black and immigrant population not only became more vulnerable to a host of deprivations but also more disposable. They lost control not only of their material possessions but also the sanctity of their bodies and their health to the necessities of surviving on a daily basis. In this instance, exchange value became the only value that counted and one outcome was that institutions and policies meant to eliminate human suffering, protect the environment and provide social provisions were transformed into mechanisms of state terror. In both cities, poor Black populations experienced a threshold of disappearance as a consequence of a systematic dismantling of the state’s political machinery, regulatory agencies and political institutions whose first priority had been to serve residents rather than corporations and the financial elite. 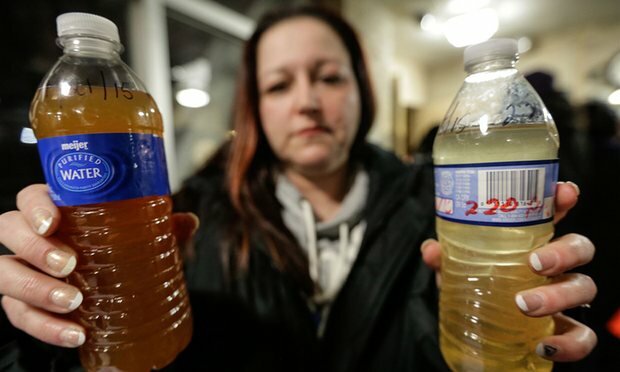 This particular confluence of market forces and right-wing politics that privileges private financial gain over human needs and public values took a drastic and dangerous turn in Flint. As a cost-saving measure, Darnell Earley, the emergency manager appointed by Snyder, and in charge of Flint in April 2014, went ahead and allowed the switch of Flint’s water supply from Lake Huron, which was treated at the Detroit water plant and had supplied Flint’s water for 50 years. The switch was done in spite of the fact that the Flint River had long been contaminated, having served as an industrial waste dumping ground, particularly for the auto industry. Via this switch, the state expected to save about $19 million over eight years. In short, peanuts for city budgets. 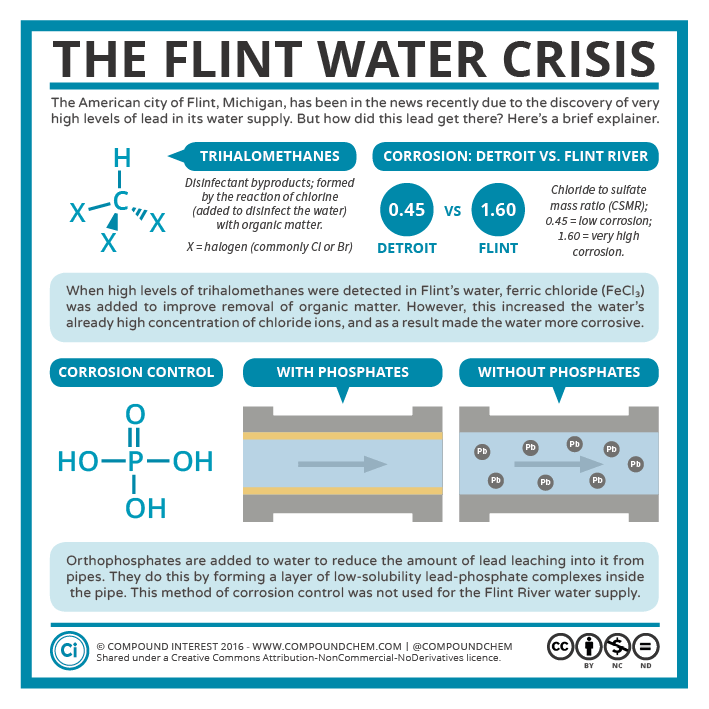 As part of the cost-saving efforts, the Snyder administration refused to add an anti-corrosive additive used to seal the lead in the pipes and prevent the toxin from entering the water supply. 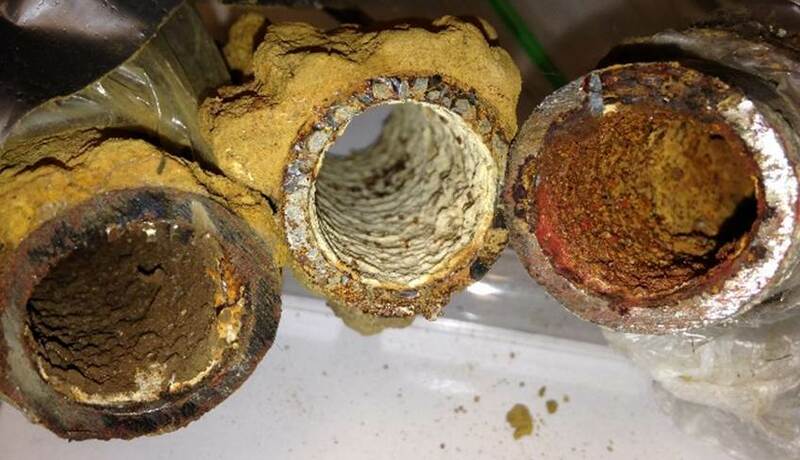 The cost of such a measure was only “a $100 a day for three months.” Yet the refusal to do so had catastrophic consequences as the Flint water supply was soon poisoned with lead and other contaminants leaching from corroded pipes. First, the water was infested with bacteria. 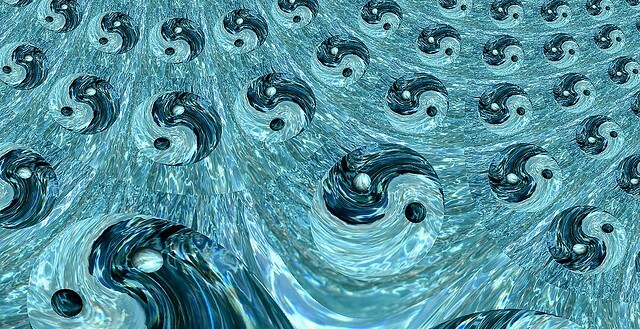 Then it had cancerous chemicals called trihalomethanes, or TTHMs. A deadly outbreak of Legionnaires’ disease, which is caused by a water-borne bacteria, spread throughout the city, killing 10 people. And quietly, underground, the Flint River water was corroding the city’s aging pipes, poisoning the drinking water with lead, which can cause permanent developmental delays and neurological impairment, especially in children. It gets worse. The genesis of the Flint water crisis reveals the disturbing degree to which the political economy of neoliberalism is deeply wedded to deceit and radiates violence. In the early stages of the crisis, according to Daniel Dale of the Toronto Star, people showed up at meetings “with brown gunk from their taps … LeeAnne Walters’ 4-year old son, Gavin was diagnosed with lead poisoning” and yet the Snyder administration stated repeatedly that the water was safe. Dale argues that the Snyder administration poisoned the people of Flint and that “they were deceived for a year and a half,” not only exposed to disposable waste, but also being made into an extension of disposable waste. Well, all three of my sons are anemic now. They have bone pain every single day. They miss a lot of school because they’re constantly sick. Their immune systems are compromised. Myself, I have seizures. I have diverticulosis now. I have to go in February 25th for a consultation on a liver biopsy. Almost every system of our bodies have been damaged. And I know that we’re not the only one. I’m getting calls from people that are so sick, and they don’t know what to do. 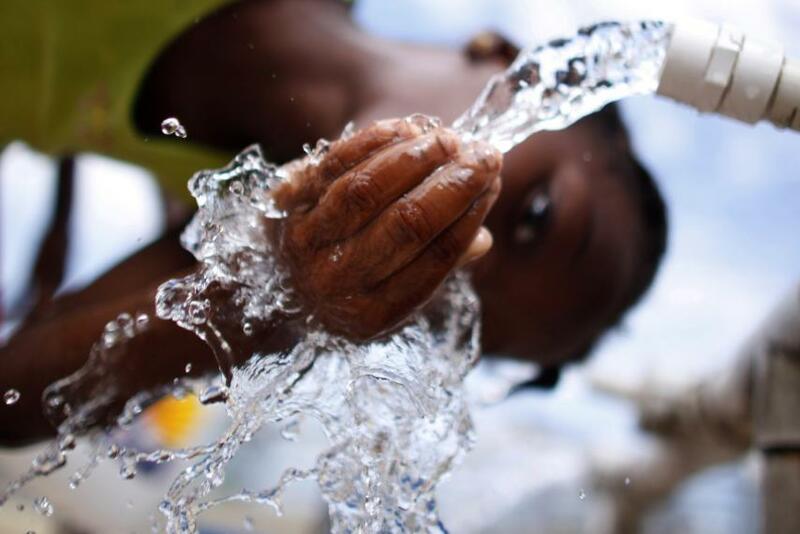 In spite of a number of dire warnings from a range of experts about the risks that lead poisoning posed for young children, the Snyder administration refused to act even when repeated concerns were aired about the poisoned water. But there is more at work here on the part of Michigan officials than an obstinate refusal to acknowledge scientific facts or an unwillingness to suspend their cruel indifference to a major crisis and the appropriate governmental action. Those who complained about the water crisis and the effects it was having on the city’s children and adults were met initially with a “persistent tone of scorn and derision.” When a local physician, Dr. Mona Hanna-Attisha, reported elevated levels of lead in the blood of Flint’s children, she was dismissed as a quack and “attacked for sowing hysteria.” When the US Environmental Protection Agency (EPA) warned that the state was “testing the water in a way that could profoundly understate the lead levels,” they were met with silence. 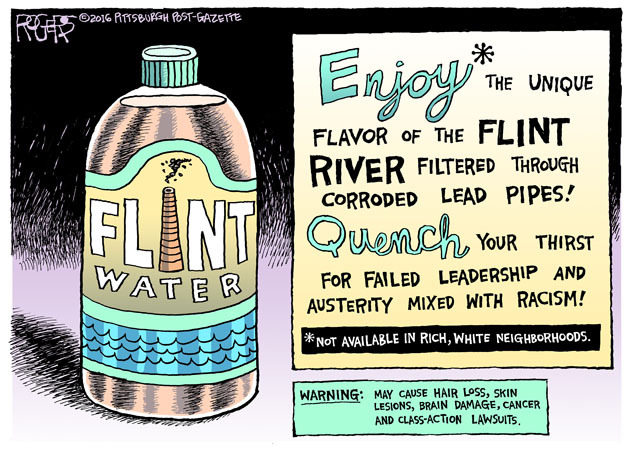 The New York Times added fuel to the fire engulfing key government officials by noting that “a top aide to Michigan’s governor referred to people raising questions about the quality of Flint’s water as an ‘anti-everything group.’ Other critics were accused of turning complaints about water into a ‘political football.’ And worrisome findings about lead by a concerned pediatrician were dismissed as ‘data,’ in quotes.” As a last straw, government officials blamed both landlords and tenants for neglecting to service lead-laden pipes that ran through most of the city. What they failed to mention was that the state’s attempt to save money by refusing to add an anti-corrosive chemical to the water is what caused the pipes to leach lead. Many states have lead-laden pipes but the water supplies are treated in order to prevent corrosion and toxic contamination. Comparably, Hurricane Katrina revealed what right-wing Republicans and Democrats never wanted the public to see: the needless suffering and deaths of poor residents, the elderly, the homeless and others who were the most vulnerable and powerless to fight against the ravages of a political and economic system that considered them redundant, a drain on the economic system and ultimately disposable. 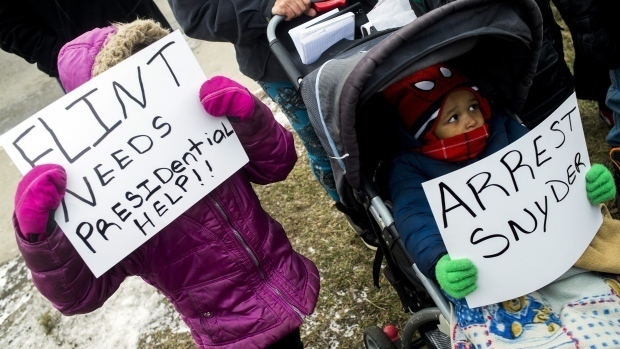 Flint imposed a different order of misery – and one more consciously malevolent – creating a generation of children with developmental disabilities for whom there will more than likely be no adequate services, either at present or when they become adults. These are the populations the Republicans and some right-wing Democrats since the 1980s have been teaching us to disdain and view as undeserving of the social, political and personal rights accorded to middle-class and ruling elites. Both Katrina and Flint laid bare a new kind of politics in which entire populations, even children, are considered disposable, an unnecessary burden on state coffers, and consigned to fend for themselves. 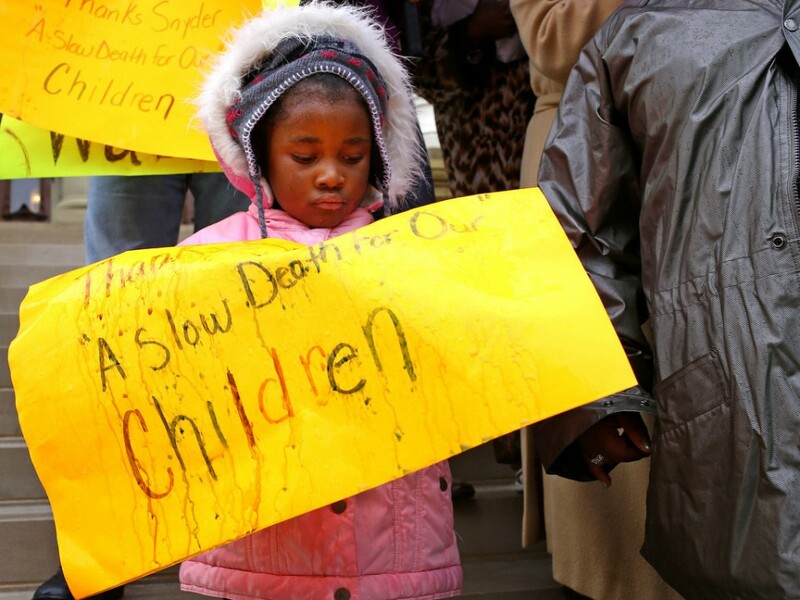 In the case of Flint, children were knowingly poisoned while people who were warning the Snyder administration and Flint residents about the dangerous levels of lead in the water were derided and shamed. Also laid bare was the neoliberal mantra that government services are wasteful and that market forces can take care of everything. This is a profit-driven politics that strips government of its civic functions, gives rise to massive inequality and makes clear a three-decades-long official policy of benign neglect being systemically transformed into a deadly form of criminal malfeasance. How else to explain that while Snyder eventually admitted to the crisis in Flint, he not only tried to blame the usual suspect, inefficient government, but also once again made clear that the culture of cruelty underlying his neoliberal policies is alive and well? This was evident in his decision to charge residents extremely high bills for poisoned water and his decision to continue sending shutoff notices to past-due accounts despite widespread popular condemnation. At stake here is a politics of disposability, one that views an expanding number of individuals and groups as redundant, superfluous and unworthy of care, help and social provisions. The poor Black residents of Flint and countless other cities in the United States now represent disposable populations that do not present an ethical dilemma for the financial elite and the politically corrupt. Social death now works in tandem with physical death as social provisions necessary to enable people to live with dignity, decency and good health are taken away, regardless of the misery and suffering that results. The confluence of finance, militarization and corporate power has not only destroyed essential collective structures in support of the public good, but such forces have destroyed democracy itself in the United States. In a society in which it is more profitable to poison children rather than give them a decent life, incarcerate people rather than educate them and replace a pernicious species of self-interest for any vestige of morality and social responsibility, politics is emptied out, thoughtlessness prevails and the commanding institutions of society become saturated with violence. Americans are now living in an age of forgetting, an age in which a flight from responsibility is measured in increasing acts of corruption, violence, trauma and the struggle to survive. Flint is symptomatic of a mode of politics and governance in which the categories of citizens and democratic representation, once integral to a functioning polity, are no longer recognized, and vast populations are subject to conditions that confer upon them the status of the living dead. Under the auspices of life-threatening austerity policies, not only are public goods defunded and the commons devalued, but the very notion of what it means to be a citizen is reduced to narrow forms of consumerism. At the same time, politics is hijacked by corporate power and the ultra-rich. As Wendy Brown writes in Undoing the Demos, this makes politics “unappealing and toxic – full of ranting and posturing, emptied of intellectual seriousness, and pandering to an uneducated and manipulable electorate and a celebrity-and-scandal-hungry corporate media.” Nowhere is this better exemplified than in Donald Trump’s rise to political power in the United States. What happened in Flint is not about the failure of electoral politics, nor can it be attributed to bureaucratic mishaps or the bungling of an incompetent administration. 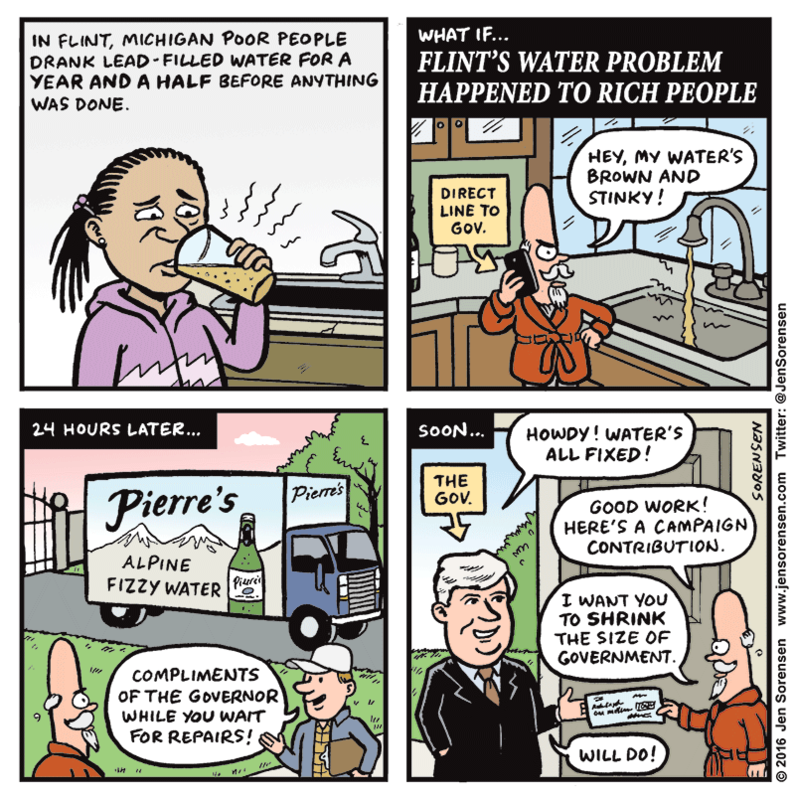 As Third Coast Conspiracy points out, the Flint crisis is necessarily understood through the lens of disposability, one that makes visible new modes of governance for those populations, particularly low-income groups, that are “rendered permanently superfluous to the needs of capital, and are expelled from the labor process, waged employment, and, increasingly, from what remains of the welfare state.” These are raced populations – poor Black and Brown people who are not simply the victims of prejudice, but subject to “systems that orchestrate the siphoning of resources away from some populations and redirect them toward others. These systems do more than just define which lives matter and which lives don’t – they materially make some lives matter by killing others more,” according to Third Coast Conspiracy. As democratic institutions are hollowed out, powerful forms of social exclusion and social homelessness organized at the intersection of race and poverty come into play. In Identity: Conversations With Benedetto Vecchi, Zygmunt Bauman discusses how these forms of social exclusion produce without apology “the most conspicuous cases of social polarization, of deepening inequality, and of rising volumes of human poverty, misery and humiliation.” How else to explain the criminal inaction on the part of the Snyder administration once they learned that Flint’s residential drinking water was contaminated by lead and other toxic chemicals? A number of emails from various administration officials later revealed that Snyder had received quite a few signs that the city’s water was contaminated and unsafe to drink long before he made a decision to switch back to the Detroit water system. Unfortunately, he acted in bad faith by not taking any action. A few months after the initial water switch, General Motors discovered that the water from the Flint River was causing their car parts to erode and negotiated with the state to have the water supply at their corporate offices switched back to the Detroit water system. Similarly, a Flint hospital noticed that the water was damaging its instruments and decided to set up its own private filtering system. A local university did the same thing. It was only after a lead scientist from the EPA and a volunteer team of researchers from Virginia Tech University conducted a study of Flint’s water supply and concluded that it was unsafe that the Snyder administration came clean about the poisoned water supply – but not before the Michigan Department of Environmental Quality had tried to discredit the research findings of the group. As one of the volunteers, Siddhartha Roy, pointed out in an interview with Sonali Kolhatkar, “we were surprised and shocked to see [the government] downplaying the effects of lead in water, ridiculing the results that all of us had released, and even questioning the results of a local Flint pediatrician. They tried to discredit us researchers.” But it was too late. The scientists may have been vindicated, but not before close to 9,000 children under the age of 6 had been poisoned. This is a manufactured crisis parading as a cost-cutting measure under Republican and Democratic parties that supported neoliberal-inspired austerity measures and aggressive deregulation. For instance, Congress in 2012 slashed funding for lead programs at the CDC by 93 percent; in addition, lobbyists for the chemical industry have worked assiduously to prevent their corporate polluters from being regulated. The United States has a long history of reckless endangerment of the environment, producing toxic consumer goods such as lead paint, lead gasoline and cigarettes, and other pollutants produced and sold for profit. Moreover, it has an equally long history of scientists both studying and calling for prevention, but who have been too often unsuccessful in their efforts to fight the corporate machineries of death with their armies of lobbyists defending the industry polluters. 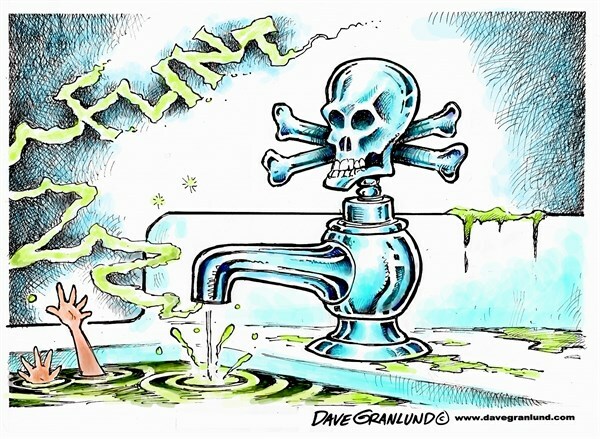 Contemporary lead poisoning is not simply about a failure of governance, deregulation and corporate malfeasance; it is also the toxic byproduct of a form of predatory neoliberal capitalism that places profits above all human needs and social costs. As Rosner and Markowitz argue, the poisoning of Black and Latino children represents a broader political and economic crisis fed by a “mix of racism and corporate greed that have put lead and other pollutants into millions of homes in the United States.” But pointing to a mix of racism and corporate greed does not tell the entire story either about the crisis in Flint or the broader crisis of environmental racism. And solutions demand more than fixing the nation’s infrastructure, replacing the country’s lead pipes, curbing the power of polluting corporations or making visible what amounts nationally to a public health crisis. Flint suffers from a much broader crisis of politics, agency, memory and democracy that now haunts the future of the United States with the threat of an impending authoritarianism. 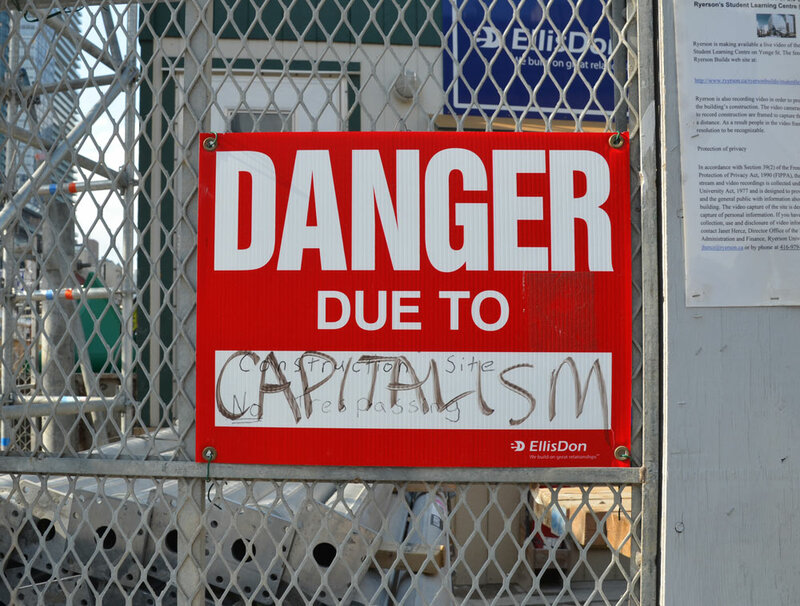 Extracting capital, labor, time, land and profits from the poor and powerless is now a central feature of austerity in the age of precarity, and has become a first principle of casino capitalism. How else to interpret the right-wing call to impose higher tax rates on the poor while subsidizing tax breaks for megacorporations, force poor people to pay for poisoned water, refuse to invest in repairing crumbling schools in poor black neighborhoods, allow CEOs to make 350 times as much as their workers, bail out corrupt banks but impose huge debts through student loans on young people or allow 250,000 people to die each year from poverty – more than from heart attacks, strokes and lung cancer combined? Disposability and unnecessary human suffering now engulf large swaths of the American people, often pushing them into situations that are not merely tragic but also life threatening. According to Paul Buchheit, the top .01 percent of Americans, approximately 16,000 of the richest families, “now own the same as the total wealth of 256,000,000 people.” Buchheit rightly labels the ultra-rich in the United States as “the real terrorists” who buy off politicians and lobbyists responsible for making poor children disposable, gutting the welfare state, enabling billionaires to hide their wealth in offshore accounts, corrupting politics, militarizing the police and producing a war culture. In addition, they fund populist movements that embrace hate, racism, militarism, Islamophobia, ignorance, xenophobia and a close affinity to the racial politics of fascism. War and terror as a form of state violence are part of the regime of cruelty let loose upon the children and adults of Flint, revealing all too clearly how in an authoritarian state the move from justice to violence becomes normalized, without apology. What the Flint catastrophe reveals is a survival-of-the-fittest ethic that replaces any reasonable notion of solidarity, social responsibility and compassion for the other. Flint makes clear that rather than considering children its most valuable resource, contemporary neoliberal society considers them surplus and disposable in the unflagging pursuit of profits, power and the accumulation of capital. 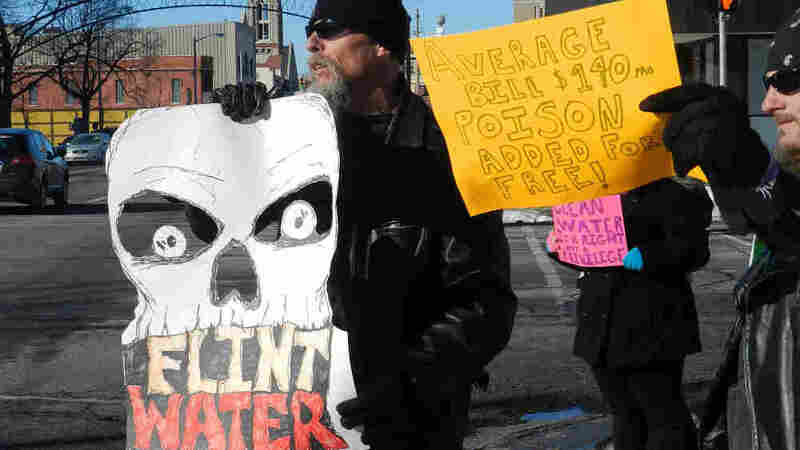 Chris Hedges is right in stating, “The crisis in Flint is far more ominous than lead-contaminated water. It is symptomatic of the collapse of our democracy. Corporate power is not held accountable for its crimes. Everything is up for sale, including children.” Flint points to a dangerous threat to US democracy in which a neoliberal capitalism no longer simply throws away goods, but also human beings who do not fit into the script of a militarized, market-driven social order. 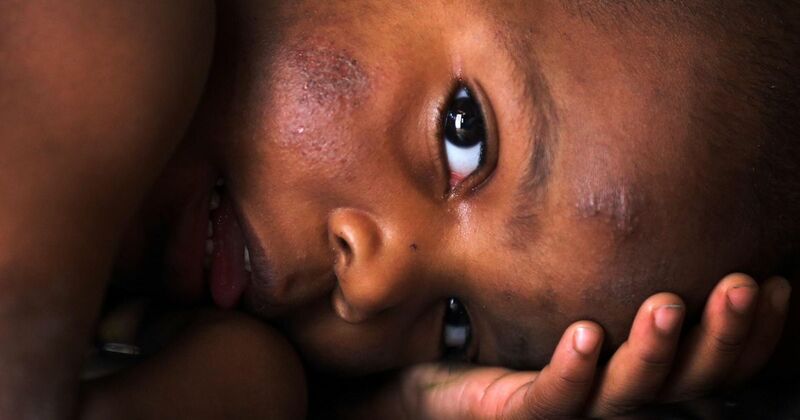 As we have learned from the scandalous condition of the public schools in Detroit and in many other collapsing public institutions in the United States, the victims are mostly children who inhabit immense pockets of poverty, attend broken-down schools with rats and other infestations, and live in environments filled with toxins. The characteristics of this new regime of disposability are all around us: the rise of finance capital, the elimination of the welfare state, the emergence of the punishing state, escalating police brutality against black people, the expansion of the war machine, the selling off of public goods to private and corporate interests, the refusal to address the nation’s crumbling infrastructure, the increasing impoverishment of larger segments of the population, environmental racism, unemployment for large numbers of young people as well as low-skill jobs, and skyrocketing debt. At work here is a systemic attempt to eliminate public spheres and the common good whose first allegiance is to democratic values rather than the conversion of every human need, aspiration and social relationship into a profitable investment and entrepreneurial enterprise. But there is more. Neoliberal capitalism thrives on producing subjects, identities, values and social relations that mimic the logic of the market and in doing so it undermines the public’s desire for democracy. It works through a notion of common sense and a language that views people primarily as consumers, atomized and depoliticized individuals who are led to believe that they have to face the world alone and that all relationships are subordinated to self-promotion, self-interest and self-aggrandizement. There is a strong argument to be made that neoliberal capitalism in its millennial moment, portends the death of politics by hiding its own ideological underpinnings in the dictates of economic efficiency: in the fetishism of the free market, in the inexorable, expanding needs of business, in the imperatives of science and technology. Or, if it does not conduce to the death of politics, it tends to reduce them to the pursuit of pure interest, individual or collective. Rather than inform the social imagination, memory under the reign of neoliberalism has become an obstacle to power, a liability that is constantly under assault by the anti-public intellectuals and cultural apparatuses that fuel what I have called the disimagination machines that dominate US culture. Memory must once again become the contested activity of self-criticism, renewal and collective struggle. Resistance is no longer simply an option in an age when the language of politics has morphed into the narrow discourse of the market. The promise of shared rule has been eclipsed and given way to the promise of a large stock portfolio for some and the despair and anxiety of facing daily the challenge of simply trying to survive for hundreds of millions more. One consequence is that a market economy is transformed into a market society, making it easier to normalize the notion that capitalism and democracy are synonymous. As democracy enters a twilight existence and the drumbeat of authoritarianism becomes louder and more menacing, organized and collective resistance is a necessity. Flint reveals the omissions, lies and deceptions at the core of this neoliberal public pedagogy and provides an opening to mobilize and harness a developing sense of injustice and moral outrage against neoliberal common sense and its predatory policies. Doing so is a crucial part of a sustained struggle to democratize the economy and society. Flint is a wake-up call to make the power of the financial elite and their political lackeys both visible and accountable. Moral outrage over the poisoning of the children and adults of Flint must draw upon history to make visible the long list of acts of violence and domestic terrorism that has come to mark the last three decades of neoliberal governance and corruption. 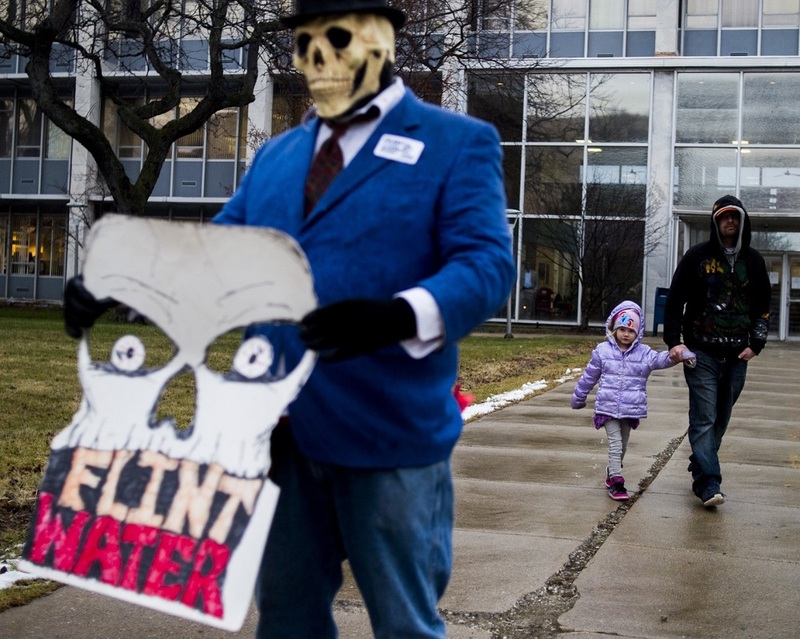 Flint speaks to both a moral crisis and a political crisis of legitimation. Democracy has lost its ability to breathe and must be brought back to life. The tragedy of Flint provides a space of intervention, and we are seeing glimpses of it in the reaction of black youth all over the United States who are organizing to connect acts of violence to widespread structural and ideological motivations. Flint offers us a time of temporal reflection, a rupture in common sense and a recognition that with shared convictions, hopes and collective struggle, history can be ruptured and opened to new possibilities. Flint calls out not only for resistance, but also for the search for an alternative to an economic system whose means and ends are used to discipline and punish both the general public and its most powerless populations. Today we are witnessing a new kind of fidelity to a distinctively radical politics. 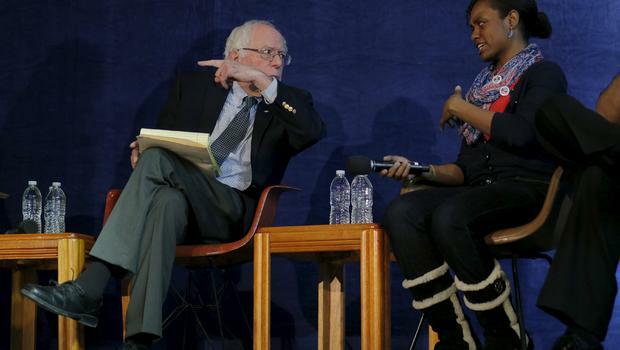 What young people such as those backing Bernie Sanders and those in the Black Lives Matter movement are making clear is that economics cannot drive politics, violence cannot be the organizing principle of the state and markets cannot define the present and future. There has never been a more important time to rethink the meaning of politics, justice, struggle, collective action and the development of new political parties and social movements. The Flint crisis demands a new language for developing modes of creative and long-term resistance, a wider understanding of politics and a new urgency to develop modes of collective struggles rooted in wider social formations. At a time when democracy seems to have disappeared and all facets of everyday life are defined by a toxic economic rationality, Americans need a new discourse to resuscitate historical memories of resistance and address the connections among the destruction of the environment, poverty, inequality, mass incarceration and the poisoning of children in the United States. But most importantly, if the ideals and practices of democratic governance are not to be lost, educators, artists, intellectuals, young people and emerging political formations such as the Black Lives Matter movement need to continue producing the critical formative cultures capable of building new social, collective and political institutions that can both fight against the impending authoritarianism in the United States and imagine a society in which democracy is viewed no longer as a remnant of the past but rather as an ideal that is worthy of continuous struggle.